I don't know why I hadn't seen these before. 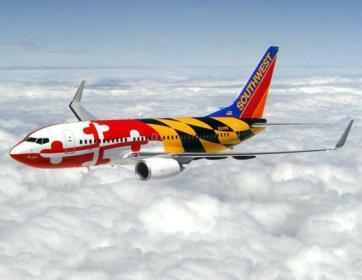 I mean, Southwest Airlines is based here in Dallas, Texas. And they've always had a bit of "flair" in how they run their business and how they decorate their aircraft. And I'd seen a couple of these uniquely painted planes before: the one (well, apparently, there's actually three of them) painted to look like Shamu, the orca, or killer whale; and the one painted as the Texas flag. But the other day, I ran across some photos of some other Southwest planes, of a more heraldic nature. 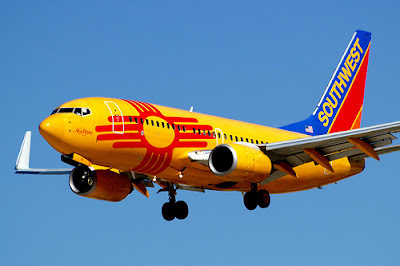 Another plane has the flag of the State of New Mexico, with a red stylized sun symbol, also looking (and acting) heraldic. So if you find yourself near an airport serviced by Southwest Airlines, you might keep an eye out for one of these aircraft. You could be rewarded by seeing some flying heraldry!